The site of a thriving boomtown during the California Gold Rush, historic Old Town Sacramento now serves as a reminder of a bygone era, but is also a unique location for engagement photography in the Northern California. 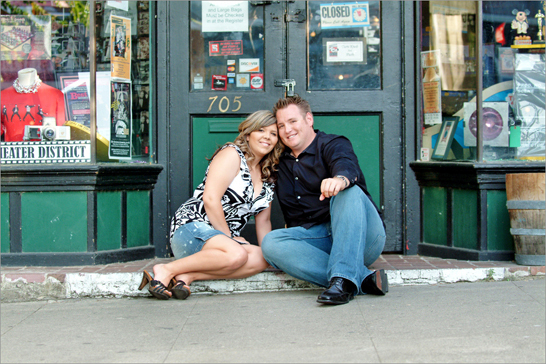 Start off your engagement photo shoot at the old town's famous Big Four House. Built in 1852, this structure was once a valuable business establishment that provided supplies for eager miners dreaming of striking it rich. You and your fianc'e can strike poses right in front of the entrance doors or seated on one of the old barrels on the wooden porch. Have your engagement photographer create a portrait of you and your loved one beside one of the lamp post playing in the sand outside the Big Four House, with the entire building serving as a backdrop. Once you've finished at the Big Four House, move on to Sacramento's historic Old Schoolhouse Museum. The schoolhouse building stands as a stoic reminder of the Gold Rush era and will add to the rugged ambience of your engagement photo album. Take a seat on the wooden front steps or step behind the white picket fence in the side yard for some great old-fashioned photos. You can also pose beneath the large shade tree in the side yard. Finally, take a short walk over to the California State Railroad Museum, where you and your fianc'e can amble along the railroad tracks as your engagement photographer takes some candid photos. 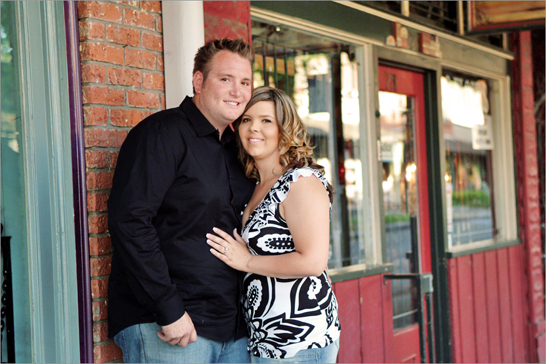 Old Town Sacramento is one-of-a-kind photography location that you're not likely to find in your friends' engagement albums! The one-time home of a former California governor, U.S. Senator, and railroad magnate, the magnificent Leland Stanford Mansion is an exemplary display of the Renaissance Revival architectural style and a perfect location for your engagement photo shoot. As you arrive at the estate, have your engagement photographer arrange a portrait of you and your fianc'e strolling around the front courtyard. You can also pose on the ornately designed front steps, as well as beneath the elegant arched front entrance. On either side of the mansion you'll find a finely landscaped, miniature yard that will provide shade trees, flower beds, and patches of lush green grass. Feel free, also, to explore the gardens behind the estate, which have towering palm trees and cozy benches scattered throughout. Only a few blocks away from the Leland Stanford Mansion you'll find Crocker Park, one of the capital's many recreational parks. Your engagement photographer will snap some informal photos as you wander the park grounds, using the surrounding greenery as a vibrant backdrop. Crocker Park contains a plethora of massive oaks sprinkled around the perimeter, as well as an expansive verdant lawn. You'll also find numerous wooden picnic benches that will work great as simple props. Finally, the glimpses of downtown Sacramento that are visible from within the park will combine with its scenery to create a rare mixed background, filled with natural and urban space. 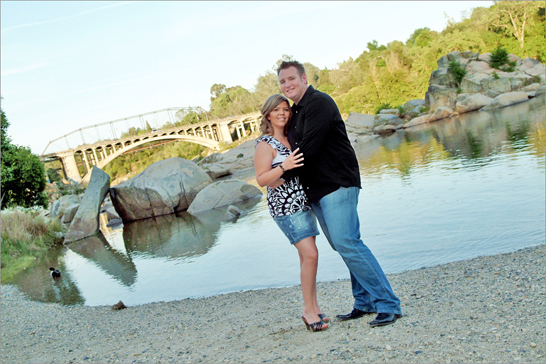 For a truly unique engagement photography location, visit Fairytale Land in Sacramento's William Land Park. Revisit your favorite childhood stories while your engagement photographer creates some fun-filled snapshots of you and your fianc'e! Pose for a portrait with your Prince Charming at King Arthur's Castle or take a ride down the Old Woman's Red Shoe Slide. Next, take a leisurely stroll through the park's Crooked Mile as your engagement photographer takes some candid photos of you and your loved one. After your walk, head over to Cinderella's Pumpkin Coach, where you can take a 'ride' on a team of carousel horses or take a seated photo inside the coach, itself. Other fun spots for photos at Fairytale Land include Captain Hook's Pirate Ship, aboard The Little Engine That Could, and on the miniature red bridge overlooking the park's tranquil Japanese Garden. With so many fun places to explore, you'll never want to leave! Note that Fairytale Town has an admission cost of $4.00 on weekdays and $4.50 weekends ' just purchase your tickets at the park box office on the day of your visit! Park hours are 10 am ' 4 pm during the Fall and Winter seasons and 9 am ' 4 pm during the Spring and Summer (make sure to check the website for special extended hours, including information on holiday hours).